Reference number for this case: 9-Oct-54-Tourriers. Thank you for including this reference number in any correspondence with me regarding this case. In Tourriers, at 17 km of Angouleme, about thirty people saw in the night of the 8th to the 9th a "kind of cigar" which remained motionless at forty meters above national road N 10 during about twenty minutes. The machine which was equipped with two winglets then decided to leave at a speed of approximately 250 to 300 km/h. Aimé Michel notes that an observation occured on October 9, 1954, in Tourriers in the Charente. He indicates the newspaper Paris-Presse of October 12 as source. The two authors and ufologists indicate that in Tourriers in Charente, about thirty people observed, in the night from the 8th to the 9th of october 1954, a kind of "cigar" which remained motionless at forty meters above the National Road RN10 during some twenty minutes. The machine was equipped with two wings and left at a speed evaluated by some witnesses as approximately 2 to 300 km/h. 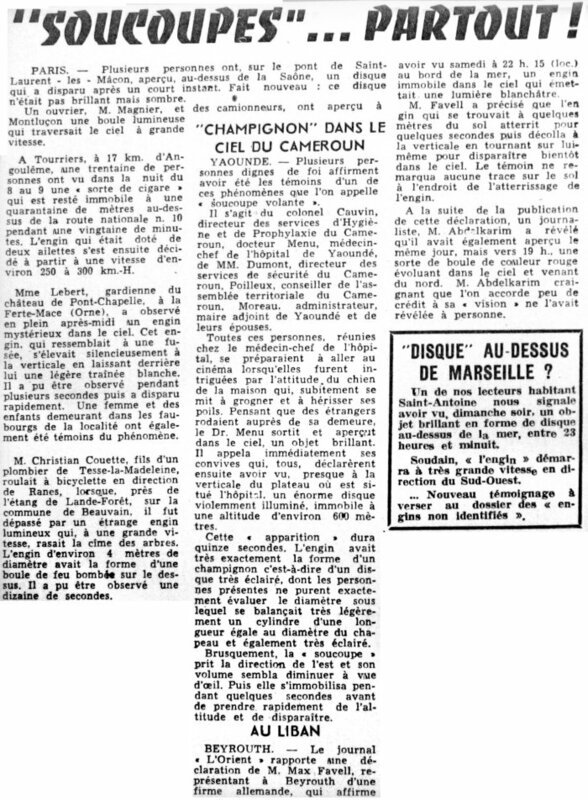 The authors indicate that the source is Le Soir-Marseille for October 11, 1954. 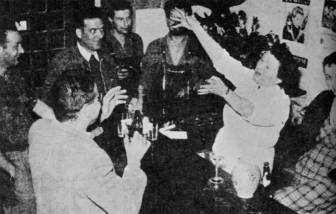 The two authors and ufologists indicate that in Tourriers in Charente, about thirty people observed on october 12, 1954, a "cigar". They indicate that the source is R. Samson, "investigator of the C.E.O. Saintes." French ufologist and author Jean Sider learned in an article from the newspaper La Charente Libre, of Angoulême, edition of October 11, 1954, on page 2, that on October 8 at midnight, an anonymous truck driver saw, while descending the slope which leads to Tourriers in the department of the Charente, in the gleam of his headlights, a large mass which had just risen from the left edge of the road. The mass stopped within forty meters of the ground, it had the shape of a rugby ball and had 4m50 in length, 1m50 in width and 2m of diameter. The witness alerted people who were still at the "Relais des Routiers" at the edge of National Road RN10 at the exit of Tourriers, whose owner was Mr. Pruneau. The Belgian ufologist indicates in her chronology that in 1954, in France, in Tourrier, "about thirty people observed in the night from the 8th to the 9th of October a kind of cigar which remained motionless at forty meters above the RN 10, during about twenty minutes. The machine was equipped with two wings and left at a speed evaluated by some witnesses as approximately 200 to 300 km/h." The source is indicated as "M. FIGUET/ J.L. RUCHON: 'Ovni, Premier dossier complet...' Alain Lefeuvre pub. 1979, p. 135." Luc Chastan indicates that in Charente with Tourriers on October 8, 1954 at an unknown hour, "about thirty people observed in the night from the 8th to the 9th of October a kind of cigar which remained motionless at forty meters above the RN 10, during about twenty minutes. The machine was equipped with two wings and left at a speed evaluated by some witnesses as approximately 200 to 300 km/h." The website indicates that on 9 October 1954 there was a sighting in Tourriers, France. talk of the sighting at the coffee shop. 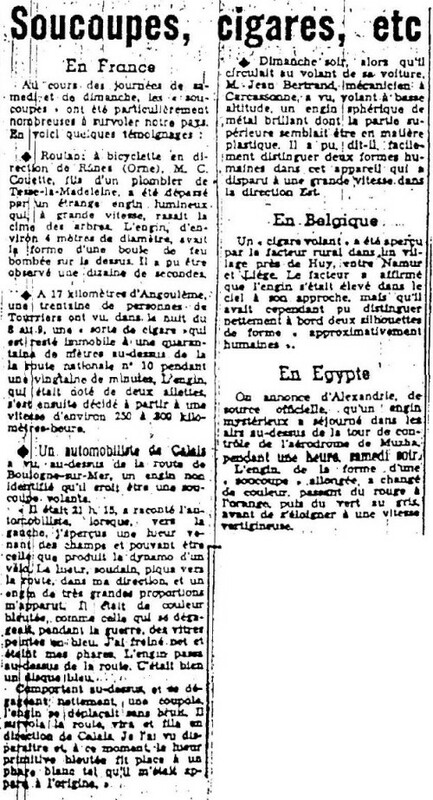 [---] Article in the local newspaper Le Soir-Marseille, Marseilles, France, October 11, 1954. [---] R. Samson, C.E.O. Saintes. [fr2] "OVNI, Premier Dossier Complet des Rencontres Rapprochées en France", book by Michel Figuet and Jean Louis Ruchon, Alain Lefeuvre publisher, France, page 158, 1979. 1.1 Patrick Gross March 11, 2009 Addition [fr2]. 1.3 Patrick Gross June 16, 2010 Addition [lm1].